Whether it’s the residential sector or comprehensive installations within offices, to highly sophisticated applications and even beyond, by now wireless networks can be found in almost all market segments. Wireless LAN has become far more than a mere network to supply wireless Internet connectivity. The technology is now part of a business processes. Due to the large variety of applications, it is hard to mention all of them. Nevertheless, these are the most common applications. The wireless Internet access and e-mail connection are the most common applications for sure. Some companies have even stopped using LAN cabling to a great extent. Retailers often use mobile cash registers connected via wireless LAN. Logistic companies, as well as retailers, register incoming and outgoing goods by wireless barcode scanners. And while we are on the subject of retailers and logistic companies, they nearly always have several locations and hence they are chain stores. Today’s wireless LAN networks have become increasingly available throughout the entire company infrastructure. Therefore a variety of access points are required for a seamless network and of course, for a central management and monitoring of sometimes numerous access points, wireless LAN controllers are used. We will now describe the suitability of wireless LAN controllers for chain stores in order to facilitate the monitoring and configuration of wireless LAN networks in different branches. Thus the central management and monitoring of all access points in all branches should be prioritized. Working via a WAN connection a wireless LAN controller in remote operation, secured via a VPN tunnel, has some specific characteristics. In the graph above the wireless LAN controller located at the central site communicates via a secured VPN connection to numerous access points which are located in several branches. These access points in the graph above are fat access points. Basically the wireless LAN controller centralizes configuration and monitoring. It is advantageous to process the user data in the various branches locally in order to limit the data volume transferred via the WAN connection secured by VPN. This is the case in many applications. Initially, as a fail-safe operation, a supermarket chain for example, usually processes on site and hence decentralizes the data of the supermarket checkouts and wireless barcode scanners. Only in the evening at closing time data synchronization takes place between the branches and the Head Office. A further problem which occurs with the remote operation of a wireless LAN controller, is the availability of a WAN connection secured via VPN. Naturally a VPN connection cannot guarantee a hundred percent availability. Even managed VPN services only assure an availability that ranges between 95 and 98 percent. After all this could mean a failure of several days a year. 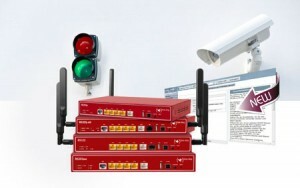 Traffic limitation between access points and the wireless LAN controller. Self-sufficient operation of access points that can run for a specific period of time without being connected to the wireless LAN controller. Users should make sure that the data can be processed locally in order to bridge downtimes of the VPN connections. Bintec WLAN products can deliver a simple and powerful platform that solves common problems such as reliability, security and local/remote management of the whole WLAN network across the WAN and individual Access Points. Total integration with Teldat or bintec-elmeg routers and management platforms is indeed a strong added value for those customers who already have a significant installed base of these devices. Moreover, it is also a great added value for those who plan to deploy a large number of branch office infrastructure and need a complete network solution for wired and wireless connectivity.